As a mining city, Katowice’s sudden growth in the 19th century was fuelled by its rich coal seams. The plush tenement houses of the Śródmieście district were all funded by this new wealth. But there are also innovative worker settlements like Nikiszowiec and Giszowiec, where miners and their families had a high quality of life, and which are still complete today. 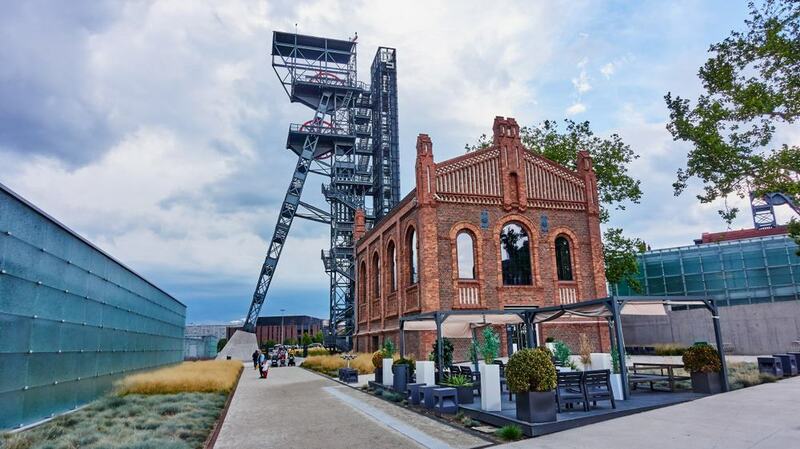 Meanwhile one former colliery has been remodelled as the Silesian Museum, with galleries built into old mining tunnels. The political history of Katowice and the Upper Silesia region is incredibly complex, and entails uprisings, a plebiscite and an autonomous state within Poland. 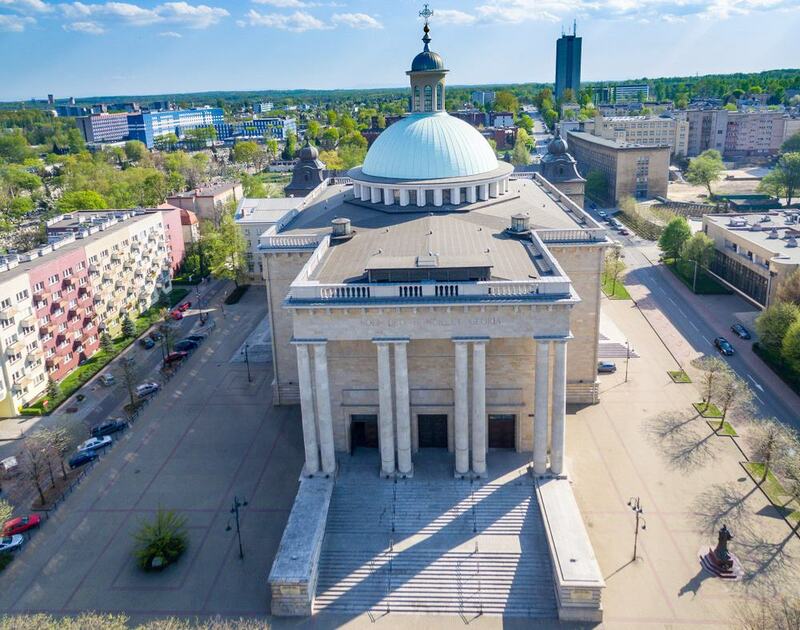 Luckily there are museums and monuments to fill in the gaps, while Katowice is blessed with a raft of architectural wonders, from a hulking Neoclassical cathedral to Spodek, a UFO-like arena from the 1970s. From a distance the first thing that will hove into view as you approach the Silesian Museum is the giant headframe that had stood idle after the Katowice colliery around it closed in 1999 after almost 180 years. Now that tower has an observation platform open in summer. The headframe isn’t the only part of the mine that has been converted, as four levels of subterranean tunnels below have been turned into galleries for art, photography, ethnography and archaeology and much more. The idea behind moving all of the exhibitions underground is to avoid interfering with Silesia’s post-industrial landscape, and daylight filters into the galleries from glass cubes at the surface. At a museum as out-of-the-ordinary as this it hardly matters what’s on show, but the exhibition of Polish art from 1800-1945 features eminent names like Jan Matejko, Piotr Michałowski and Józef Chełmoński. 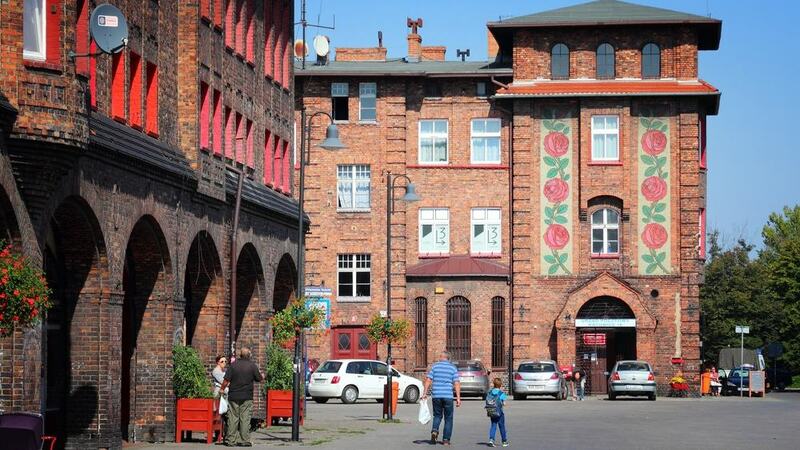 A few minutes on foot or a brief bus-ride from the centre of Katowice is a superb piece of Polish national heritage; an intact city district for 8,000 people built for miners at the Giesche colliery. Nikiszowiec was in fact a separate, self-contained city, from its completion in 1918 until it was absorbed by Katowice in 1951. The settlement had interconnected houses, each containing 12 apartments and often linked by arcades on the ground floor. There were 1,000 apartments in all, in beautiful brick buildings that had shops, a police station, bakeries, a swimming pool, a hotel, a school and church close at hand. A popular shooting location for movies, the settlement looks almost as it did a century ago and tucked into the arcades are a few specialty shops and cafes. The headquarters for this museum, and most of its departments, are in a tenement house from 1908 on Ulica Szafranka. If you wanted to pick one setting to sum up Katowice, this would be perfect, as in this period the city was growing at a dizzying rate. The permanent exhibition shows you around two apartments; one for a rich industrialist family, and another for a moderately well-off member of the new bourgeoisie. Both are complete with period furniture, personal items, appliances and decorated according to the fashion of the day. Another exhibition guides you along a timeline of Katowice from its humble origins as a rural settlement in the 1200s to the factories of the 20th century. Stanisław Ignacy Witkiewicz, one of Poland’s most revered artists is represented in the art collection, which has the set of his pastel drawings in a single museum. 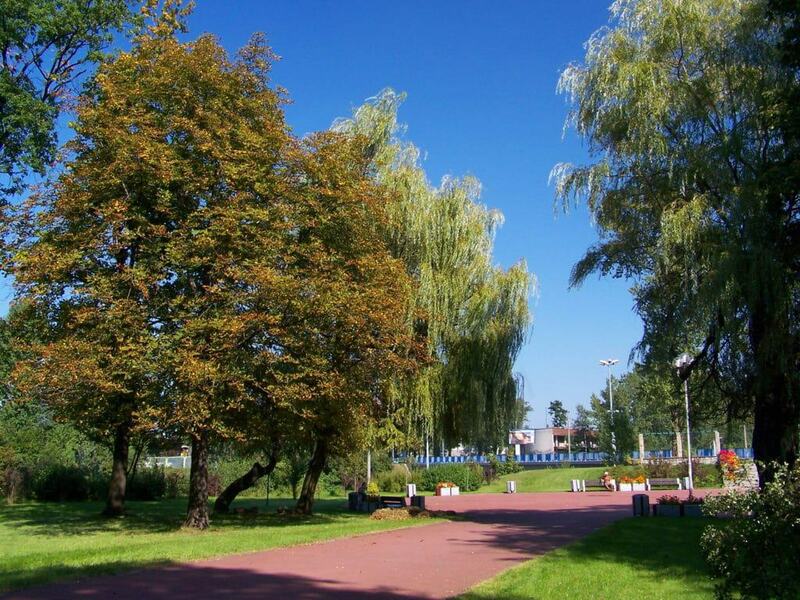 Named after one of Poland’s national heroes, Kościuszko Park is the handiest green space if you’re in the centre of Katowice, swelling from six hectares when it was inaugurated in 1888 to more than 72 today. Wreathed by an English landscape park made up of dozens of different tree species are formal flowerbeds, an avenue of roses and florid pergolas. But the park also some compelling wartime stories to tell; the parachute training tower in the park’s southern reaches is 40 metres high and dates back to before the Second World War. It was on top of this metal structure that a group of boy scouts staged a plucky attempt to defend the city against the Wehrmacht in on 4 September 1939. If you’re in town in winter there’s a toboggan run and ski slope to try out. One sight to give you a sense of place is this gigantic monument to the people who took part in the three Silesian Uprisings in 1919, 1920 and 1921. The cause was to force the Upper Silesia to join the new Polish state that had been created after the Treaty of Versailles. Poles made up 60% of the population of Upper Silesia and rebelled three times, facing off against German armed forces while campaigning for plebiscite, which took place in 1921. The monument was unveiled in 1967, stands at a maximum of 41 metres, has 350 individual parts and weighs a total of 61 tons. Each wing represents one of the uprisings, while details of the individual battles are etched on the slopes underneath. Construction of this colossal archcathedral, the largest in Poland, began in 1927 and was interrupted by the Second World War. It would finally be completed in 1955, and has powerful Neoclassical architecture epitomised by a 40-metre-high dome and an awe-inspiring portico. Despite the classical lines it’s a thoroughly modern building, with a structure made from reinforced concrete and then clad with dolomite extracted from the Imielin quarries close by. The stained glass was painted by Stanisław Pękalski, while all of the fittings were produced by one man, Mieczysław Król, in 1973. The three Silesian Bishops are buried in the crypt, and on the left side of the nave you’ll find an altar made of coal to St Barbara, patron saint of miners, commemorating those who have died in Silesia’s mines. In the central Śródmieście district, the pedestrianised Ulica Mariacka is Katowice’s main nightlife artery, leading to the bold tower of St Mary’s Church, which we’ll explore next. The street was only pedestrianised in 2008, and in 2011 a row of 30 cherry tree saplings were planted on the way, now sprinkling some colour in spring. Packed into a few hundred metres are almost 20 taverns, and many more restaurants, bistros and nightclubs. When the cars were banned in 2009 the city also invested in sprucing up the facades along the route, running the gamut from Neo-Gothic by the church on the east end to the west. See what’s on the calendar before you come, because the there’s usually something going on along the street, whether it’s a wine and cheese fair or a concert. With mass immigration to Upper Silesia and the city burgeoning in the middle of the 19th century, all these new residents needed a place of worship. The answer was St Mary’s Church, which was erected in the 1860s. And even though it’s a relatively new construction, this church has a lot of value as many of the most respected artists of the day worked on its fittings and decor. The mesmerising stained glass windows were painted by Adam Bunsch, who learned his craft at the centre of excellence in Kraków, while on both sides of the nave, the “Marian Cycle” paintings are the work of Józef Unierzyski, student (and son-in-law) of the beloved Jan Matejka. For something older, there’s a Late Gothic altar in the “Sacra Conversazione” chapel in the transept. 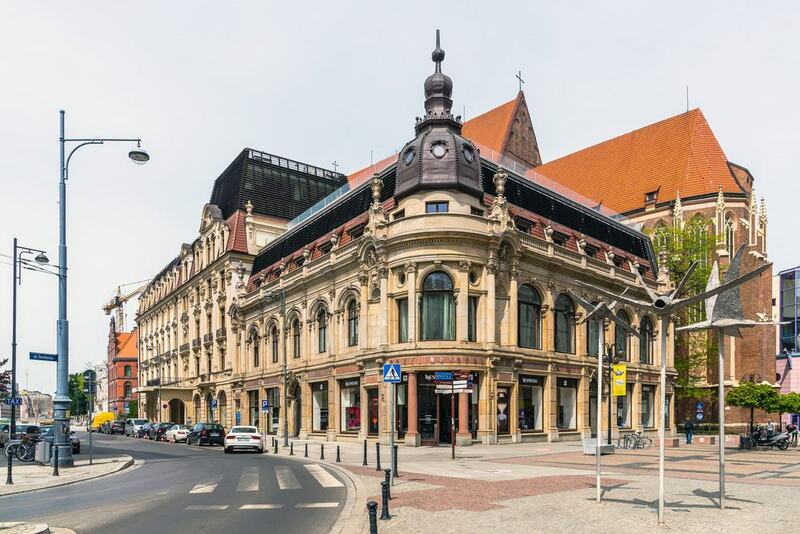 Having only gained city status in 1865, Katowice isn’t a Medieval or Renaissance idyll like Kraków or Lublin; but that doesn’t mean that the city’s architecture doesn’t have its own power. As the Śródmieście, city centre, was built in one go in the 19th century it was often compared to Paris for its many palatial tenement buildings, some with Art Nouveau design. A few examples can be found on Ulica Mickiewicza, especially the corner building at no. 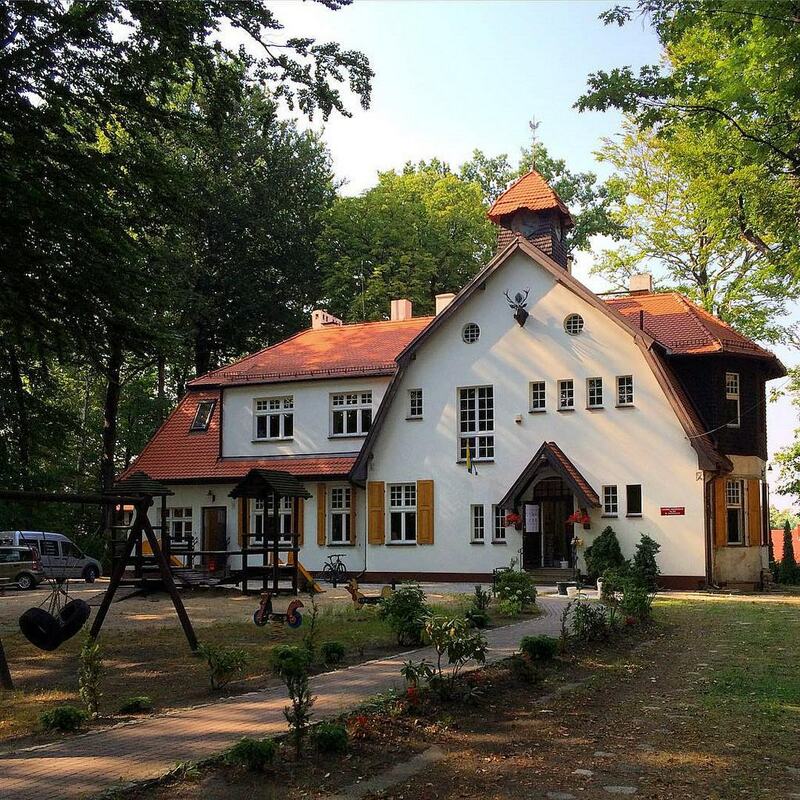 22, and the breathtaking Monopol Hotel at Ulika Dworcowa 5, from 1902. 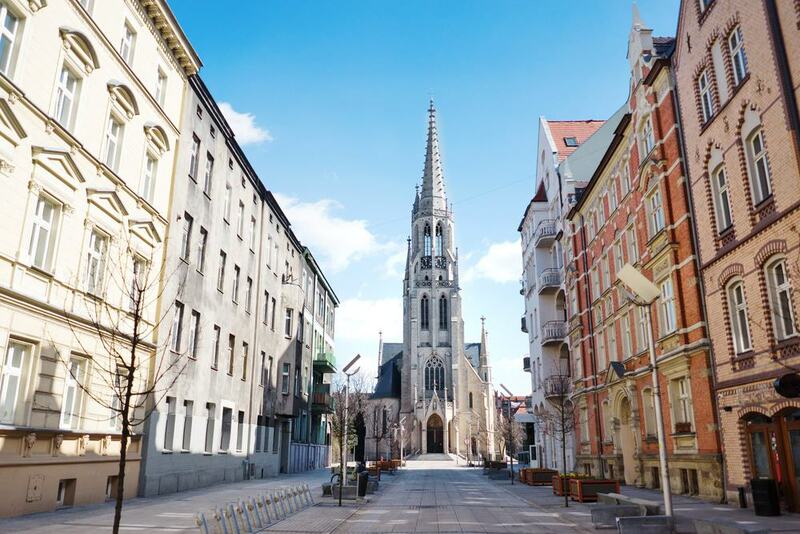 While the Market Square is a smorgasbord of 19th and 20th-century architecture with Modernist, Neoclassical, Socialist Realist and contemporary buildings. After Stalin died, architecture in Poland was able to move on from Socialist Realism to more exciting frontiers. 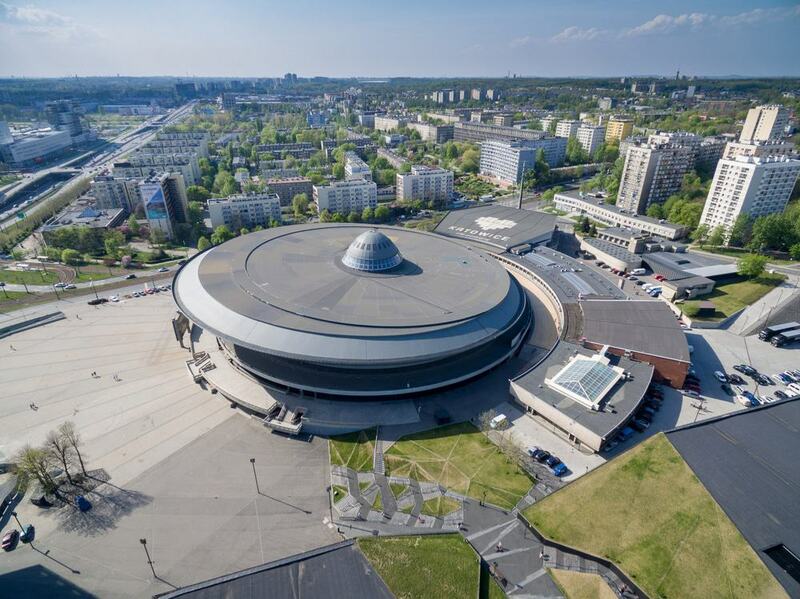 And that is the context for this outlandish building, named “Saucer” in Polish. Spodek was started in 1964 and work continued up to 1971. From then until just 2014 Spodek was the largest indoor arena in Poland, with a capacity of 11,500. And if you’re scratching your head wondering how this megastructure can support its own weight, it uses a concept known as tensegrity, a portmanteau of tensional integrity coined by the great Buckminster Fuller. The man who put it into practise here was the engineer Wacław Zalewski. More than 45 years later Spodek has outlasted Zalewski’s other landmark project, SuperSam in Warsaw, and was renovated in 2009. 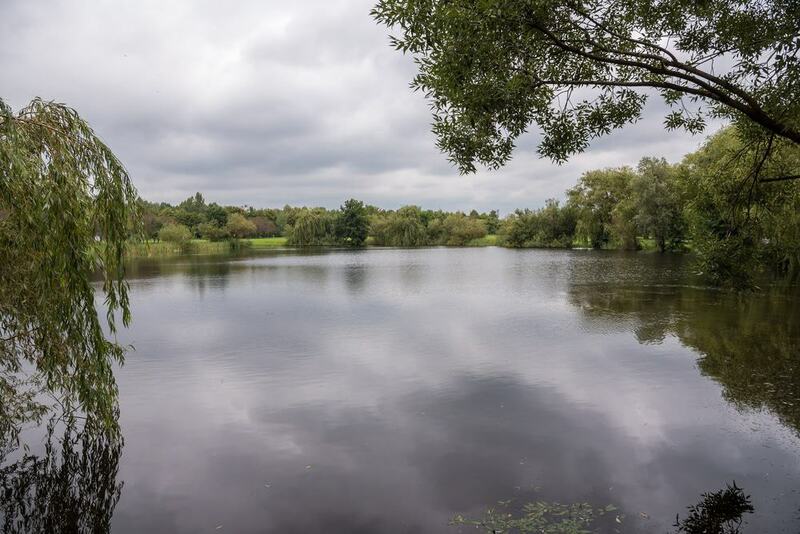 In the south of Katowice is a wooded park area spreading over 86 hectares, nine of which are taken up by water. Despite the name there are 11 bodies of water in the park. The largest ponds are set aside for recreation, mostly for fishing, but there’s also one pond with a marina for watersports and another with a beach that is a hit with families on hot days On land you can cycle or hike through lush deciduous forest, and if you don’t have your own set of wheels you can rent a bike via Katowice’s City by Bike service. 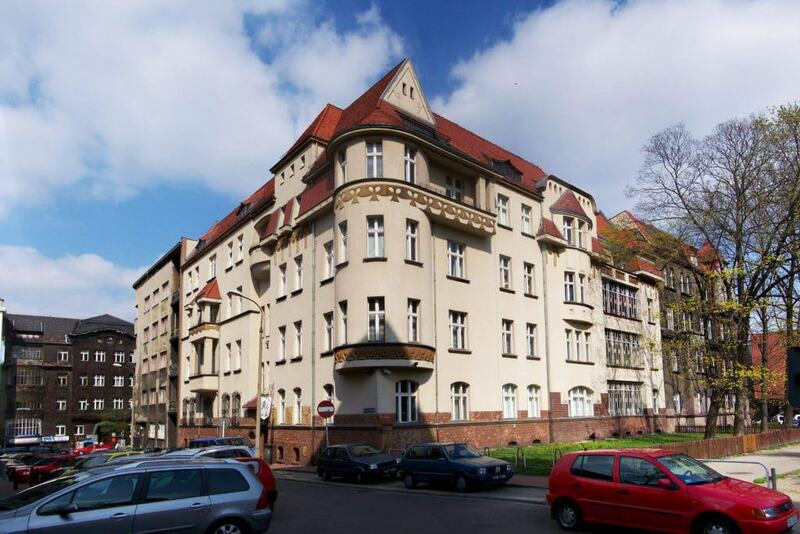 If Nikiszowiec whetted your appetite for early-20th-century urban design, there’s more a few kilometres southeast of the city centre at another miners’ settlement. Giszowiec is based on Ebenezer Howard’s concept of a Garden City and was built in just three years, providing greenery for the 600 families that moved in. Originally occupied by workers at the Giesche Mine, Giszowiec’s houses are on four main streets converging at a central lime-shaded square. The settlement soon had its own amenities like department stores, a school and a swimming pool, while a narrow gauge railway linked it with the neighbouring district of Janów. A Polish National Historic Monument, this government building was the largest edifice in Poland until the Palace of Science and Culture went up in Warsaw in 1955. 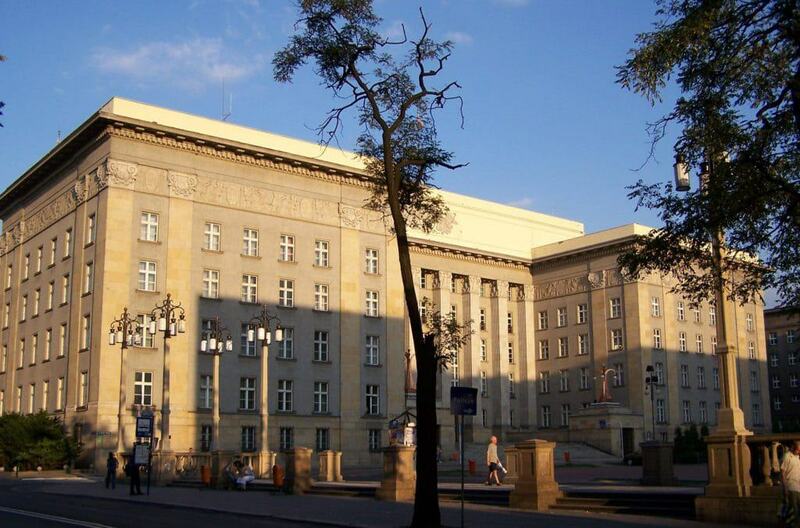 With a Neoclassical design, the Silesian Parliament was completed in 1929 to be the seat of power of the autonomous Silesian Voivodeship. This was created in 1921 following an uprising by its Polish residents and plebiscite after the First World War. The immense building still holds government offices and has one of only four paternosters (open single-person elevators) remaining in Poland. 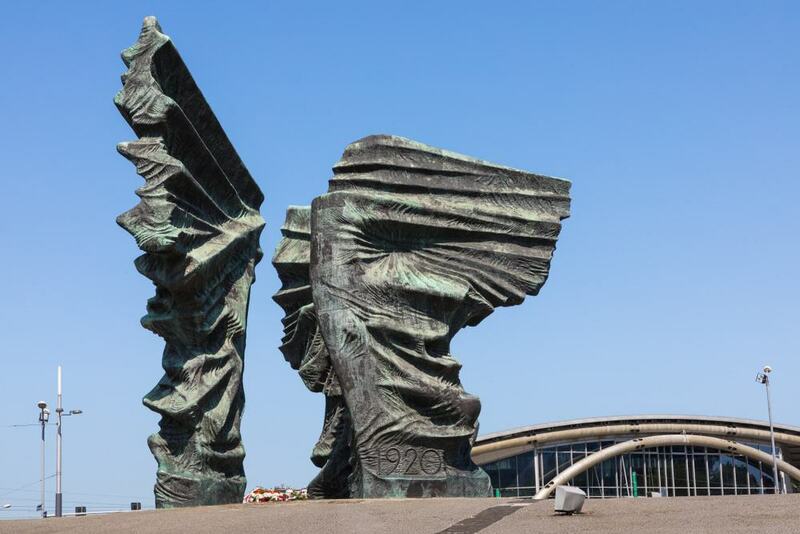 Those with a taste for culture may already know that Katowice has one of Poland’s most illustrious orchestras. The Silesian Philharmonic was founded at the end of the Second World War and played its first concert as early as 26 May 1945. Many distinguished soloists have performed with the orchestra, including Witold Małcużyński and Adam Taubitz. 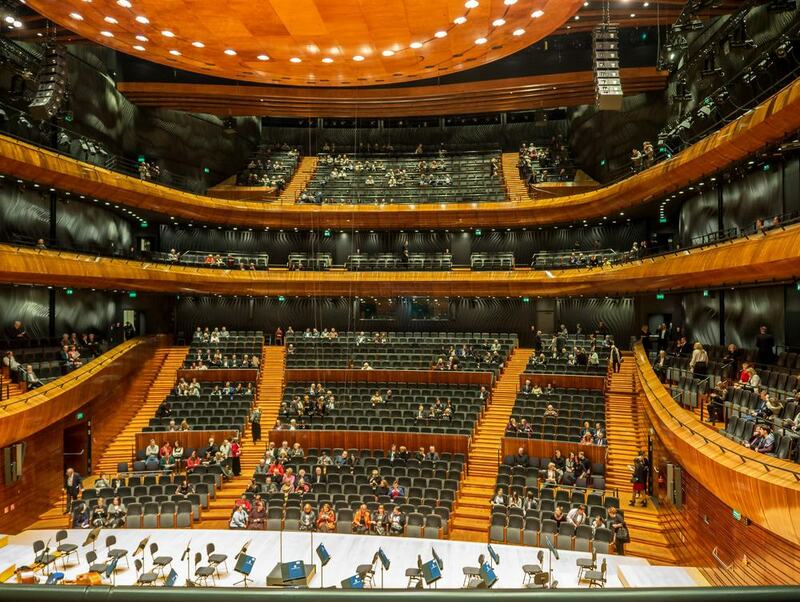 The concert hall where the orchestra, mixed choir and chamber orchestra performs is a permanent part of Katowice’s heritage and came through a renovation, furnishing it with a new glass roof in 2013. 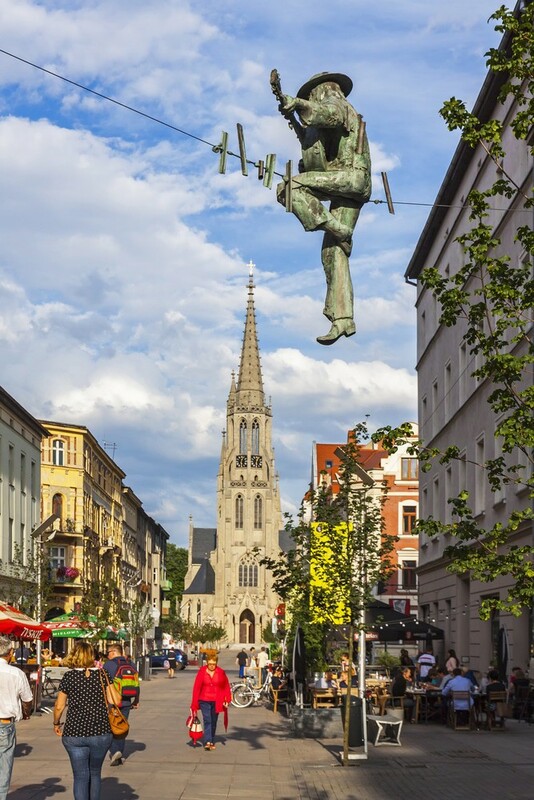 Have a look at the programme when you’re in town, and if you come with children don’t rule out a visit as along with a cycle of symphonies by the likes of Dvořák, Brahms and Mozart there are family and child-oriented performances, especially around school holidays. 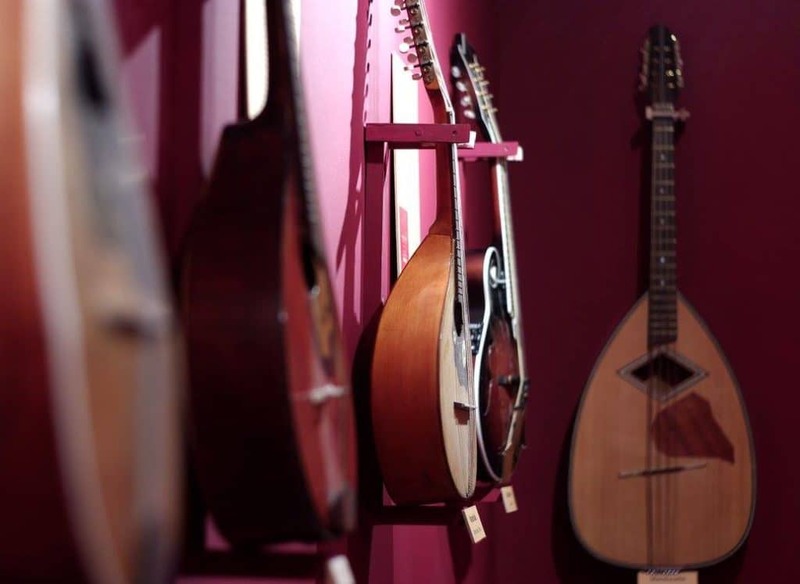 An intrepid spirit will pay off at this private museum, which is all about plucked string instruments. The attraction comes from a city-wide scheme in which culturally interesting homes can be opened up to visitors in exchange for lower rents. The museum is open during the afternoon Tuesday to Sunday, and has 60 exhibits, all of which are in working order. You’ll be able to track the development of the guitar to the instrument we know today, checking out its ancestors and relatives such as lutes and torbans.